Scientists have developed an ingestible pill-sized device that will provide doctors with a 3D view of the esophagus. The capsule is attached to a string-like tether and contains optical frequency domain imaging (OFDI) technology, which uses a rapidly rotating laser tip emitting a beam of near-infrared light and sensors that record light reflected back from the esophageal lining. Physicians may soon have a new way to screen patients for Barrett’s esophagus, a precancerous condition usually caused by chronic exposure to stomach acid. Researchers at the Wellman Center for Photomedicine at Massachusetts General Hospital (MGH) have developed an imaging system enclosed in a capsule about the size of a multivitamin pill that creates detailed, microscopic images of the esophageal wall. The system has several advantages over traditional endoscopy. 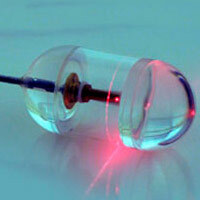 The system developed by Tearney and his colleagues involves a capsule containing optical frequency domain imaging (OFDI) technology – a rapidly rotating laser tip emitting a beam of near-infrared light and sensors that record light reflected back from the esophageal lining. The capsule is attached to a string-like tether that connects to the imaging console and allows a physician or other health professional to control the system. After the capsule is swallowed by a patient, it is carried down the esophagus by normal contraction of the surrounding muscles. When the capsule reaches the entrance to the stomach, it can be pulled back up by the tether. OFDI images are taken throughout the capsule’s transit down and up the esophagus. The researchers tested the system in 13 unsedated participants – six known to have Barrett’s esophagus and seven healthy volunteers. The physicians operating the system were able to image the entire esophagus in less than a minute, and a procedure involving four passes – two down the esophagus and two up – could be completed in around six minutes. A typical endoscopic examination requires that the patient stay in the endoscopy unit for approximately 90 minutes. The detailed microscopic images produced by the OFDI system revealed subsurface structures not easily seen with endoscopy and clearly distinguished the cellular changes that signify Barrett’s esophagus. Study participants who had previously undergone endoscopy indicated they preferred the new procedure. Additional co-authors of the Nature Medicine report are lead author Michalina Gora, PhD, of the Wellman Center; Robert Carruth, Kevin Gallagher, Lauren Kava, Mireille Rosenberg, PhD, and Brett Bouma, PhD, Wellman Center; Jenny Sauk, MD, MGH Gastroenterology; and Melissa Suter, PhD, MGH Pulmonology. Support for the study includes National Institutes of Health grants R01DK091923 and R01CA103769. The tethered capsule endomicroscopy technology has been licensed for commercial development to NinePoint Medical, Inc., of Cambridge, Mass. Be the first to comment on "Ingestible Pill-Sized Imaging System Provides 3D View of the Esophageal Wall"